I don’t have much sense of coloring. Have no idea which color matches which color would look better. Besides, [Coloring] is more like for kids! 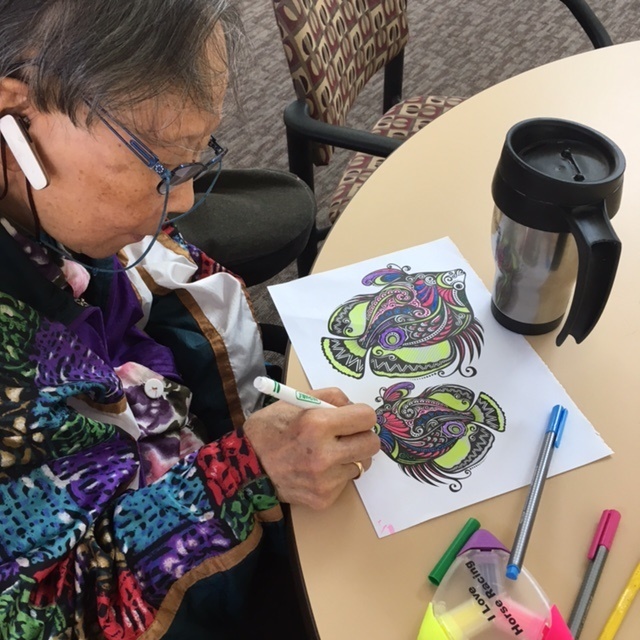 Until one day our Activity Manager Aliona sat a coloring hour for us. 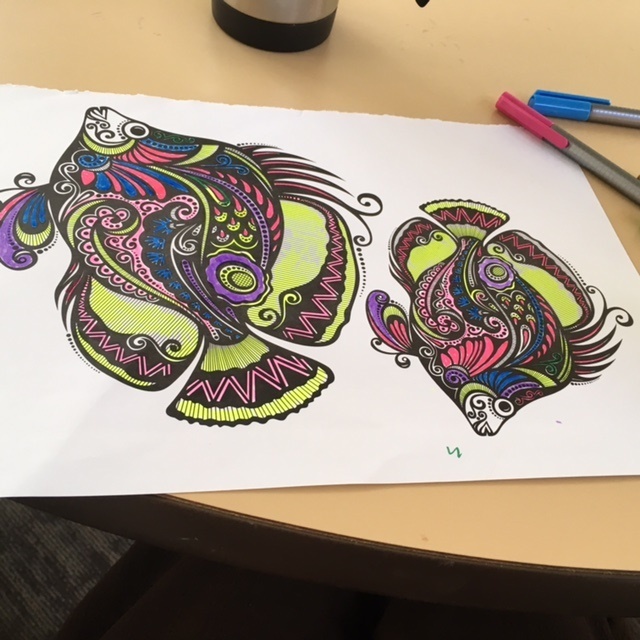 I found great joy in coloring! It is not kids’ stuff only! There were more than 10 residents signed up the class! Very soon almost all of the coloring pens were taken. I grabbed the leftovers before they were all gone! I choose the page of fish without much thinking. When I about to start working on it , I was not too happy with those colors I had. I had them because there was no choice for me because the other colors were too soon to be taken! That’s all left for this old turtle could have! As I began to color, I noticed that many of the designs were similar and everyone was so exquisite. I must be very careful when I color them. Otherwise, the colors will be all mixed up. It could look awful. I was so involved once I began coloring. Nothing could bother me at that moment at all! I was enjoying the working! And so happy about every achievement I did. Those colors worked perfectly! I was glad I have them! After I finished the whole page, it looked nice! I realized no matter what color you color a Mandela picture after you finished the whole thing, it will look good and unique! But, if I have never taken the first step to try to color, the picture would always stay black and white. The beauty of colors will never show. Her class helped me to build up my confidence! The “KEY” is in my own hand! Previous Post What is that for? Next Post That’s My Guy! Wendy, thank you for your encouragement. By the way, how is your friend Chirsty doing? It doesn’t matter Catholic or not. God is love! He listens prayers. Trust God. Put Christy in God’s hands. Whatever He do, will be the best. My heart is with you, Wendy. God bless you and Christy’s family. You are so right Myra, ‘colouring’ (English spelling), is a very therapeutic exercise and definitely not only for children. Your colouring was lovely. Your description – ‘I was so involved once I began coloring. Nothing could bother me……’ perfectly describes being lost in the activity. I hope you do lots more colouring in the future. Perhaps a simple colour wheel would help you with colour choice, although I think even though you didn’t have a lot of choice, your colours worked very well indeed. By the way thank you for following my blog. Thank you! Barbara! I never thought coloring could be a therapeutic exercise. I ‘m really going to do some more. I love to visit your blog. I started with the online Mandala designs. Perfect way to spend idle time. Wow! Online “Mandala designs”? That is even better! Could you give me some information? I’d like to try it too. Just downloaded the app on android. I see. But I don’t have android. How about PC window 8? I love your fish! Beautiful. Good! We should organize a coloring group!